Oooooh, it’s like lemon meringue pie without the meringue. Which is fine by me, never much liked meringue anyway. 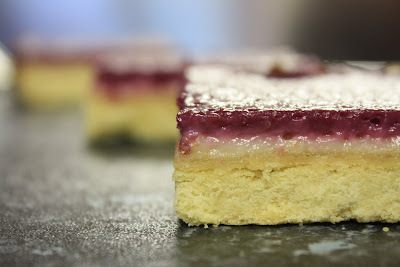 Or, you can layer it up and have double flavours; later you can see a variation where I have used lemon and blackberry. These are seriously good. I’d pay for one of these. They are fairly simple to make also which is always a bit of a bonus. So, start by greasing an 8x8” pan with some oil and then dust it with flour to prevent the base sticking. 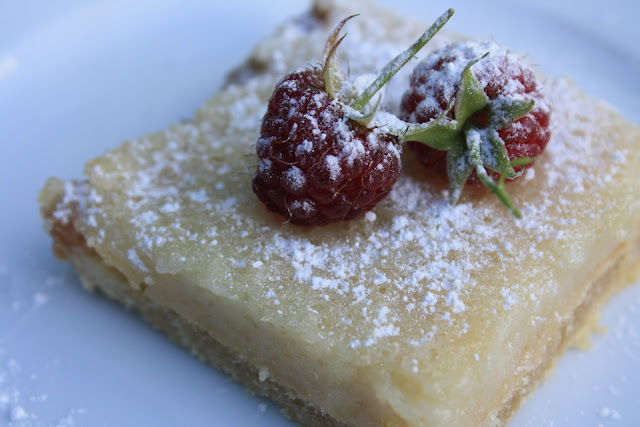 In a mixing bowl, cream together 112g soya margarine and 25g icing sugar before mixing in 150g plain flour. Tip this dough out into the tray and flatten it out – it looks as if it isn’t going to be enough, but once it’s all smoothed out evenly it makes a perfectly thick base. Bake at 180⁰ for 20 minutes. Don’t forget this bit or else the rest will go a bit funny – I tried it by mistake once. For the topping, blend together 112g silken tofu, 200g granulated sugar, the zest of a lemon, the juice of that lemon made up to 90ml with water, 2 tbsp plain flour and 1 tbsp cornstarch. Again, you may think this bit looks a bit too runny, but trust me, it will be fine. Pour it onto the cooled base and then pop back in the oven at 180⁰ again for 20 minutes or so, until the filling is set. Remove from the oven and stand to cool. Once cool, you should be able to neatly slice it up as you so desire. Dusting the slices with icing sugar is a nice touch but do each one individually before serving else the icing sugar will just disappear into the topping. Now, a pretty alternative to this is to divide the topping mixture into two. Then divide the flavours you want to use into two also. I made a variation using half lemon filling and then half I substituted the lemon with a handful of blackberries which gives a gorgeous, deep purple colour. I would imagine any sort of berry would work well. I like the fruity flavour of these slices. Lemon is always lovely and refreshing, not too heavy. These slices are reminiscent of a Millionaire’s shortbread though, so perhaps one day I will get around to perfecting a caramel that doesn’t break teeth and then that can be a more sinful variation!